The Denison Art Department had its BFA group show at 4 North Park Place in downtown Newark this April. Students displayed their art work throughout the three floors of the building after an intense clean-up of several days. The idea was to create a space that would show a symbiotic relationship between students’ artwork and the space itself. If you had a chance to see the show, you were in for a surprise. The entire, huge building with its seemingly endless rooms is a work of art. Over the years, the slow decay of walls and ceilings has created patterns and shapes that are stunningly beautiful to a point where sometimes the intentionally created art struggles to compete with what nature has created by itself. Walking through the vast space, from one dilapidated room to the next, I wonder how long these floors have been left to themselves to decay and wither away behind a perfectly well maintained facade of the historic downtown building. 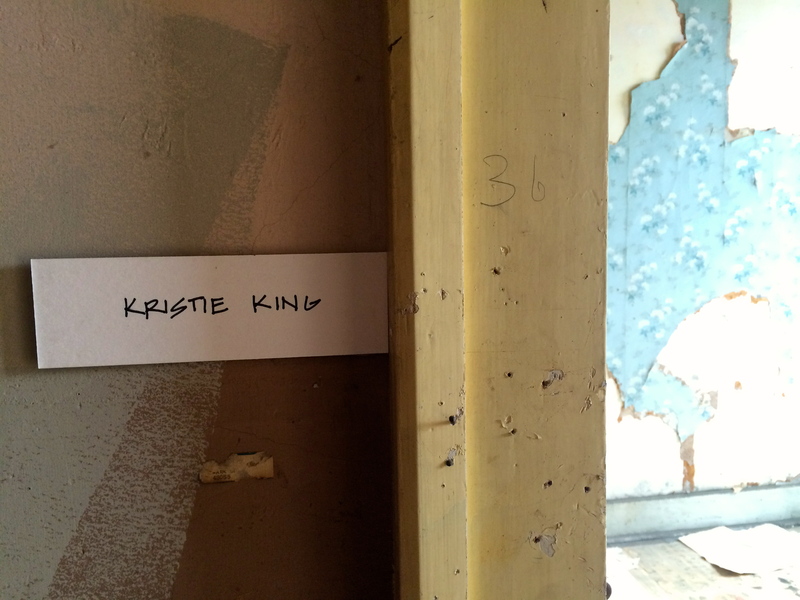 I find the answer in a room with Kristie King’s name tag by its entrance door: Tuesday, January 31, 1933 reads the date on one of the newspaper pages spread all over the floor in anticipation of a renovation project that was never completed. For 81 years this place has been abandoned at a time that would be the beginning of one of the greatest tragedies to befall Europe and with it the United States. 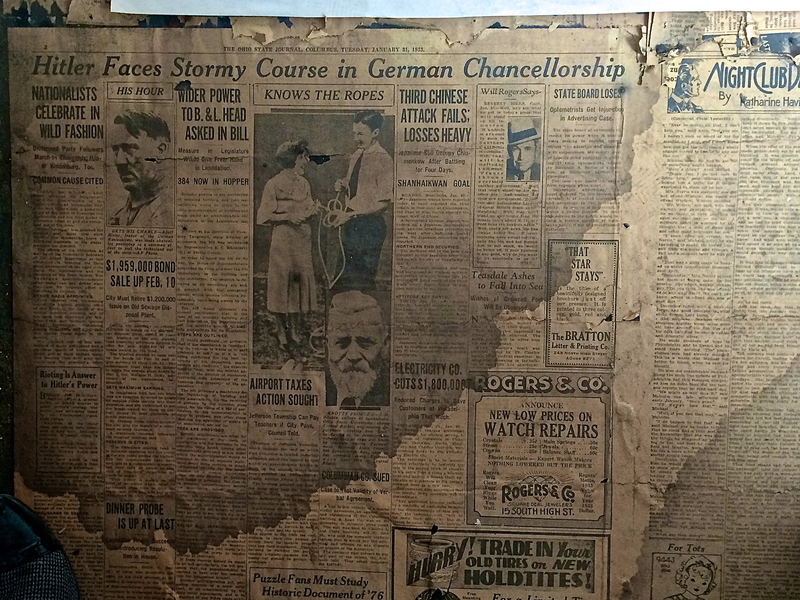 “Hitler Faces Stormy Course in German Chancellorship – Nationalists Celebrate in Wild Fashion,” reads the headline of page 2 of The Ohio State Journal with a photograph of Adolf Hitler in typical grim and hostile pose. “Gets his chance – Adolf Hitler, leader of the German Nationalists, was made chancellor yesterday in a common effort to pull the fatherland out of the mire,” its caption elaborates on Hitler’s infamous Machtergreifung (seizure of power) adopting the nationalist rhetoric of the time. The day before, on January 30th, 1933, Hitler was appointed Reichskanzler by President Hindenburg. On the day after this newspaper page was printed, Hitler gave his first national radio address, “Appeal to the German People.” By the end of World War II, tens of millions of people had died or were missing in action, about 420,000 of those were American soldiers, 23,000 were men and women from Ohio. The paper is holding up surprisingly well considering its age and its exposure to an unforgiving environment. With a little effort, even the smaller print is still legible. It is as if time had been arrested behind these historic walls. Fortunately, Kristie had the foresight to leave this room untouched and let the remnants of history speak for themselves. Newark, Ohio was founded in 1802 by Maj. William C. Schenk, who came to Ohio from Newark, New Jersey. It was incorporated into a town in 1826 and became a city in 1860. Our beautiful Second Empire Courthouse was dedicated in 1876 as the 4th courthouse on this site. It is surrounded by the Downtown Newark National Register Historic District which contains more than 90 well-preserved late 19th early 20th century commercial structures, representing a wide variety of architectural styles. Many of the shops, restaurants, attractions and points of interest are housed in these structures. What has happened to that building since that paper was spread to protect this small room’s floors from the messes of restoration 81 years ago? The second talk by Dr. Marcia Kaplan, practicing psychiatrist and psychoanalytic therapist was equally inspiring and in the same spirit as the first speaker’s. Its topic: Findings regarding firing of single neurons correlating with psychoanalytic models explaining behavior; information-processing in “bottom-up” and “top-down” ways by both brain and mind. Rich in background information and context with helpful examples made for an illustrative presentation of complex ideas that became accessible to a appreciative and interested audience. A special thank you to Christian Faur, Director of Collaborative Technologies Fine and Performing Arts at Denison University for professionally capturing and editing these talks.